Gingival recession is the technical name for receding gums. Receding gums can be one of the Gum disease symptoms. Gums are also known as Gingivae, which is the moist pink tissue that is at the base of the teeth. The roots of the teeth are not very strong like the teeth themselves and gums hold them in place firmly. Gums are dense tissues with an abundant supply of blood vessels, the outer membrane is the mucous membrane. When gums recede they expose the root of the teeth to plaque, bacteria and other factors that cause decay of the teeth. Let us try to understand why gums recede and what is the cure for it. Wearing out of the gums– Due to the vigorous brushing of teeth using hard bristles in the toothbrush can cause the gums to wear out. The teeth and gums might be healthy but the only problem is over brushing. This type of damage occurs mainly on the left side owing to the fact that most of the people hold their toothbrush in the right hand. Also, gums wear out more on the sides and not much in the front portion. Hereditary disposition – People born with very thin gum tissues can in the normal course experience wear and tear in the gums to recede. This can influence how severe your gum receding could turn out to be. 3.Gum tissue inflammation – this is generally a reaction of the immune system. In a good number of cases, the periodontal disease is the common cause of inflammation. Some people have very thin tissues which can get inflamed easily by plaque. Plaque is nothing but the formation of a thick layer on the tooth that contains bacteria, mucus, cells and other particles. When plaque is not cleaned regularly it leads to gingivitis which causes inflammation of the gums. This condition entails occurrence of periodontitis. Periodontitis occurs in the space between gums and teeth which causes loss of connective tissue and bone around the root of the tooth leading to receding gums. 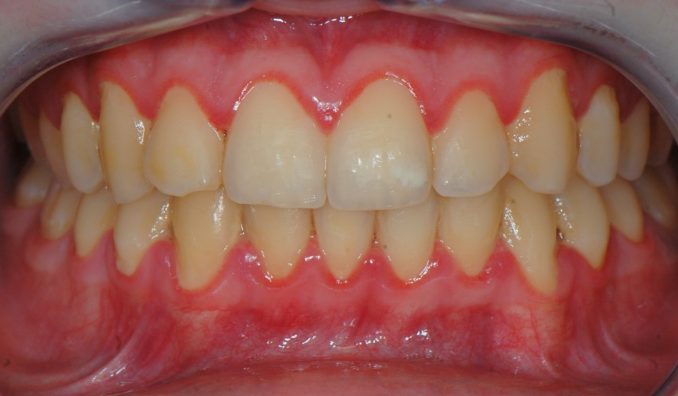 Many people are not aware of the receding gums till it has receded significantly. For those people whose lip line exposes the gums while speaking or smiling, the appearance is affected. The other problem faced is the loosening of the tooth and infection of the root. Sensitivity can be experienced while taking the hot or cold liquid and food due to the receding gums. In a good number of cases the receding gums if noticed early on do not need any treatment. The doctor educates the patient and guides them to have good practices and take good care of gums. Special toothpaste for sensitive teeth is suggested for sensitivity. In case it is more severe varnishes or dentin bonding agents may be used to reduce sensitivity. Composite restoration can be done to cover the root surface with teeth colored resins. These resins can effectively cover the black gaps between teeth. Surgery may be carried out by grafting tissue from elsewhere in the mouth. Realigning of teeth with braces can also help set right the problem in certain cases. Receding of gums can be easily prevented in most cases by taking proper care of teeth and gums and avoiding over brushing. Using soft bristles is recommended. In case of any discomfort, bleeding or pain in the teeth or gums must not be neglected. Consult a Quality dental care dentist as early as possible. Get in touch with us if you are going through gum receding problems. South Miami Family Dental is at your service! !